Based on 20-years of experience conducting 360 degree feedback surveys around the world, we'll share the best methods for preparing, administering, and rolling out the results from your 360 degree feedback survey. We'll also identify the most common mistakes organizations make when conducting 360 degree feedback surveys and how to avoid them. Get HRCI and SHRM credit for attending this webinar. Learn how to identify and engage hidden influencers within your organization. There are 3 types of influencers: role models, experts, and change agents. Correctly identifying and engaging hidden influencers is one of the greatest levers leaders have to increase organization-wide engagement. Qualifies for SHRM and HRCI credit. UPMC is operating in a healthcare environment that is incredibly complex and volatile based a variety of external factors. In order to remain agile, innovative, and positively disruptive, the organization needs highly engaged, high-performing leaders and employees to successfully execute its mission, vision, goals, and related strategies. Joe Dicianno, Ph.D., Manager of Talent Development and Organizational Development at UPMC will join us to discuss how UPMC approaches employee engagement. 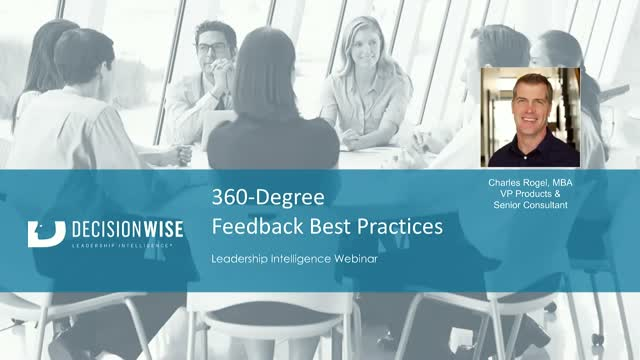 During this webcast we’ll share the best methods debriefing and coaching from the results of a 360-degree feedback survey. The course prepares HR professionals to coach individuals, interpret individual and group reports, and guide the development planning and follow-up with participants. What is the personal benefit of being engaged? What is the difference between being satisfied with your job and being engaged? How does each of the ENGAGEMENT MAGIC elements contribute to engagement? How do you avoid a victim mentality and take ownership for your engagement? How can managers create an engaging work environment? Employee engagement is recognized as a critical driver of business performance yet most people and companies struggle to understand the concept and improve. Most of us want to spend our time doing a job that we love. We want to feel energized and passionate about how we contribute to the organization. We want to have a great day at work where we feel like we accomplished something and grew from the experience. All of these feelings are part of the concept of employee engagement. Yet most of us find it difficult to achieve this level of engagement on a regular basis. How do we make it happen? Learn about the five simple keys to unlock the power of employee engagement in yourself and others. How engaged are you in your work right now? Do you know what’s missing? Employees and leaders intuitively know that when we find a place where we can throw our hearts, spirits, minds, and hearts into our work, we are happier, healthier, and produce better results. Yet, most struggle to understand exactly why we engage in some environments, and don't in others. Magic introduces the five MAGIC keys of employee engagement--Meaning, Autonomy, Growth, Impact, and Connection--and shows how leaders can help employees achieve higher levels of engagement, as well as how employees can be more successful by taking ownership for their own MAGIC. Get to know the new Engaging People Multi-rater Assessment recently released by DecisionWise. See how leaders are measured on core engagement competencies. Engagement is a learned competency. Join with us as we discuss how managers and leaders in your organization can learn to be engaged and engage their team members. Learn specific values that are associated with the engagement competencies and explore DecisionWise's new Engaging Leader Assessment. What are other organizations doing to increase Employee Engagement? What are companies doing to increase employee engagement? What is the ROI of employee engagement for most companies? How do organizations effectively measure employee engagement? Is employee engagement really working? Which programs are most effective in boosting employee engagement? Does employee engagement boost profitability? Join us as we reveal the results from this 30-question study. One question to consider as you think about whether to put effort and investment into employee engagement: "Is engagement worth the effort and investment we put into it?" The short answer to this question is "yes," but depending on the type of organization you are, engagement may be more critical or less critical to your success. During this webinar we'll share the best methods for preparing, administering, and rolling out the results from your employee engagement survey based on over 20 years of experience conducting surveys around the world. We'll also identify the most common mistakes organizations make when conducting an employee engagement survey and how to avoid them. Free HRCI & SHRM Credit. It’s nearly impossible to get traction around employee engagement initiatives without the support of the CEO and senior leadership team. During this presentation, we’ll provide tips and share case studies that not only show how to get senior leadership to “bless” engagement initiatives, but to drive them. Receive HRCI and SHRM credit for attending. During this webinar we’ll share the best methods for preparing, administering, and rolling out the results from your employee engagement survey based on over 20 years of experience conducting surveys around the world. We’ll also identify the most common mistakes organizations make when conducting an employee engagement survey and how to avoid them. About the Presenter: Christian Nielson is a Principal Consultant at DecisionWise and leads a team of consultants who conduct engagement surveys for clients around the world. He is an expert on how to conduct employee surveys and get the most from the results. We measure, analyze, and improve employee engagement. In fact, we wrote the book on employee engagement, MAGIC: Five Keys to Unlock the Power of Employee Engagement. Tune in to learn best practices on employee engagement, the employee experience, leadership development, and surveying your employees.